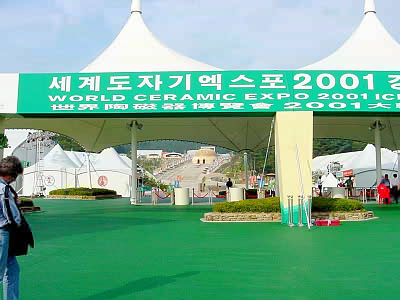 The ceramic world has all eyes on South Korea as this shy and humble 'Hermit Kingdom' hosts a world-class eighty-day ceramic expo. 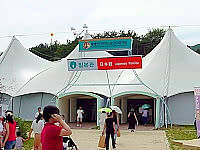 The expo, which opened on August 10 and runs to October 28, 2001, is being held at three locations all within reach from Seoul. I was there for the first few days setting up a Yakimono.net Group booth in the Japan Pavilion. It took me seventeen years of living in Japan to finally make it to Korea and I came away with a renewed respect and appreciation for the Korean styles that played a major role in shaping Japan's ceramic landscape. 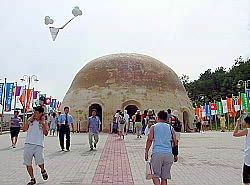 The ancient potting centers of Ichon, Yoju, and Kwangju were chosen as site locations. The main center is at Ichon. Work was still being completed when we arrived the day before the opening and that included getting our four computers all set-up and ready to go on-line. After a few hours of hurdles, like a Korean program, we finally were able to get all computers up and running. Our goal in being there is to have as many folks as possible see and know about our web sites in English and Japanese. Also, as we all know, the Internet is such a fabulous way to communicate and so many still are discovering that. Speeches and a seventeen-person tape cut and the doors swung open. The interest was indeed high with many folks coming to our booth wondering what computers have to do with pottery. We had to make a no kids policy though, as they just wanted to goof around with the keyboard and play games; this booth was for yakimono only ! After smoothing out all the work issues I took a tour of the Ichon site. 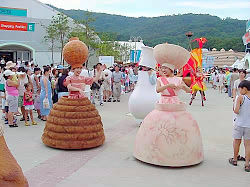 Next to the Japanese Pavilion were three shopping pavilions and a world food court. I explored all of the pot stalls, over 200 sellers from production kilns to studio potters.  Most were either Koryo-style celadon, Punch'ong stoneware, such as Mishima, and Yi dynasty white porcelain. Many were mere imitations, but a few potters were adding their own sense to the cultural heritage. Two whom impressed me were Huang Soon-Suk of the Baek Chun Pottery and Kwan Young-Bae of the Baiksan Pottery. Both are relatively young and sense the beauty in the masterpieces of ages lost and each also adds a modern sense to their works. Korea lost so much cultural heritage to the Japanese in the invasions of the late 1500s and the occupation of the 20th century. It is just now gaining lost ground and finding a revived sense of pride in their glorious cultural heritage. It's young potters like Huang, Kwan, and Lee Kyu-Tak that have taken the lead behind their mentors, such as the late Chi Soon-Taek. I found a few pieces that I fell in love with and one was a small cup from the group pictured here; it's the cup on the top row, second from the left. I was torn between that one and the bottom middle one, both being simply shibui. About an hour passed when my colleague returned and told me he had purchased a cup. Lo and behold, it was the one I had decided to pass on. Of hundreds of thousands of pots our eyes settled on the same one. 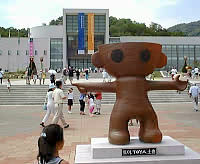 The Ichon highlight was the World Ceramic Center, pictured here with expo mascot TOYA, that was situated at the top of the hill. And what a hill it was, more like a ski slope! It is not user friendly, especially for the young and aged. There is a tram that departs from the main entrance but that was not well advertised for foreign visitors. In the center though is a grand look at all of the world's ceramics. The first floor highlights the ancient traditions of east and west while works on the second floor are contemporary, including the 1st World Ceramic Biennale 2001 Korea, and modern masters. From Japan in the latter room were works by Suzuki Goro, Miwa Ryosaku, Nakamura Kimpei, and Kaneko Jun. 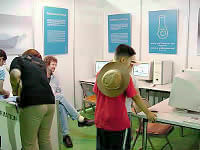 As with any expo opening there were parades, events like hands-on potting for kids, and a very festive atmosphere. I was quite surprised to see so many children there and actually interested in the pottery. About ten minutes away is the second site at Kwangju. Although much smaller in size than Ichon (less shopping pavilions), there is much to see. 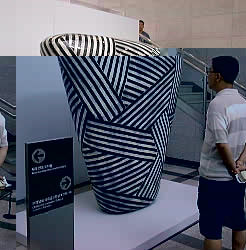 Foremost is the museum that is showcasing traditional and contemporary Korean pottery, the links between China, Korea and Japan, and an IAC members' exhibition. 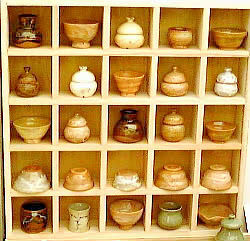 Members from Japan included many veteran Kyoto ceramic artists. The third site at Yoju was a bit of a letdown after the first two visits. First, it was far, and second, the exhibitions were not as engaging. The main museum had a look at international ceramic designs for the table -- a bit boring, NCECA members' exhibition, world aboriginal pottery -- mostly from Africa and the US. The saving grace of this site is a very good look at Korean folk wares. After looking at this exhibition I felt that the Japanese mingei movement definitely did their share of pilfering. Of course they do give much credit to the Koreans. It was, by all accounts, Yanagi Soetsu's appreciation of Korean folk art that saved it in the early 19th century. Actually, I can't think of artists Hamada or Kawai as mingei anymore as they both had such privileged upbringings and never had the troubles of Yanagi's 'unknown craftsman.' In fact, their work is so easily identifiable, like a Picasso, that a rethinking of the word mingei as it pertains to these great Japanese studio potters is in order I believe. I shall address that more in the future. All in all a wonderful expo and one that I hope brings respect and kudos to the great potters, past and present, of both Korea and the world.